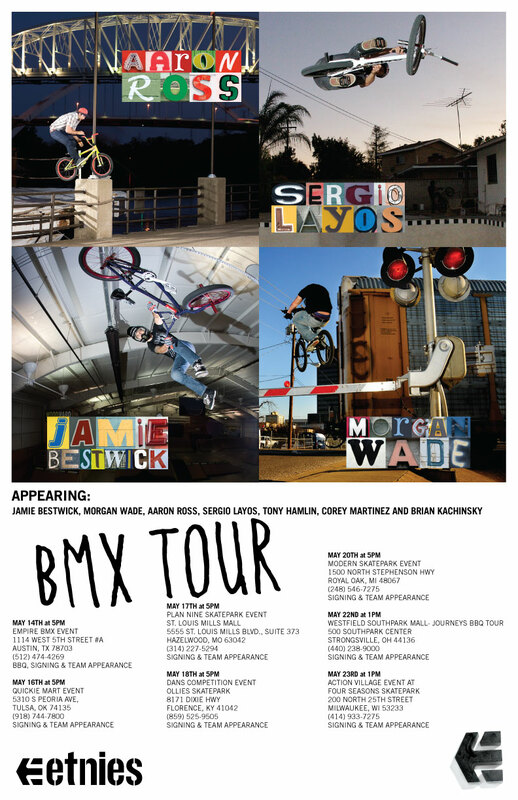 Five-time Dew Cup winner Jamie Bestwick will hit the road in May for demos and more on the upcoming Etnies BMX Tour. He'll ride with fellow Dew Tour riders Morgan Wade and Brian Kachinsky. The pro lineup also includes Aaron Ross, Sergio Layos, Corey Martinez and Tony Hamlin. Starting mid-May the seven-stop tour will head to parks in Texas, Oklahoma, Missouri and the surrounding areas. There promises to be plenty of free barbecues, autograph signings and sessions in all the sick parks on the schedule. See below for all the details.